For our first Christmas together (6 months after we started dating), Jamie presented me with a gift for both of us - a fondue pot. It was our first shared kitchen item, which was pretty exciting for me. A shared kitchen item says, you're the one I want to cook with on Friday nights, you're the one I want to splash water on while we're washing dishes, you're the one I want to trade shoulder massages with while we sip wine and watch movies... You're the one. We've eaten at The Melting Pot once, and it was a such a decadent treat of melted cheese and chocolate, something you can only do once in a great while. And as much as I love cheese, and I really love it, we've only used our fondue pot once for cheese. Because there's really only so much cheese you can eat in one sitting. I knew right away what we'd really be using the fondue pot for: Hot Pot. Hot Pot is an Asian food "experience", and something that my friends and I enjoyed a lot while living in China. 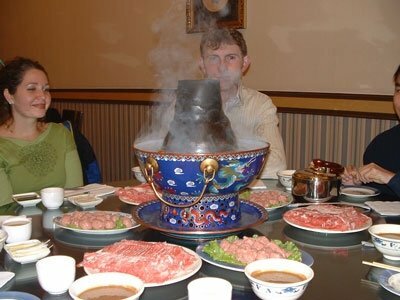 It is named Hot Pot for the pot of simmering broth placed over a burner that is sometimes built into the middle of the table or just placed under the pot. You can order the broth spicy or not spicy (or half and half), and then you order plates of meat and vegetables to cook in the broth, such as thin slices of lamb or beef, mushrooms, potatoes, noodles and leafy green vegetables. We once ordered fish hot pot, which turned out to be a mistake, as the broth was full of tiny pin bones, and what resulted was quite the choking episode from a swallowed bone! It's an interactive and leisurely meal, which is what makes it so fun, and when you take a moment to look up from eating, you notice a room filled with steam and cigarette smoke, sweaty red faces both from the heat emanating from the pot as well as from all the beer being consumed (my students used to excuse their drinking habits by telling me that beer was cheaper than water), and people stuffed to their limit with good nourishing food. I won't be giving you a recipe for this, because quite simply, you don't need one. Pour some chicken broth in your fondue pot with a little pepper, seasoning, and onions, bring it to a steady simmer, and then just prep all the food that you want to cook. We like a little bit of everything, so we usually have some tenderloin steak, salmon and shrimp, potatoes and mushrooms, and occasionally some asparagus, but I'd like to try it with some thinly sliced lamp or pork, too. Try it with your favorite meats and veggies, though, and it will be delicious. Dipping sauces are a great addition to the meal, too; pictured in this post are bowls of soy sauce, honey mustard, tartar sauce and balsamic vinegar. Cocktail sauce is great, too, but sadly, we didn't have any horseradish in the fridge the other night to make it (just mix together ketchup and horseradish for homemade cocktail sauce). We eat hot pot now every couple of months, and it's one of my favorite ways to relax and remember a little taste of Asia in an American way.